Midvale History 1851 - 1979 Book. A story of the people, places and events of Midvale Utah. "A touching story of some who began by living in shelters dug in the banks of the Jordan River where some Gosiute Indians had dwelt in caves before them. This story is but the skeleton of their physical, almost super-human efforts to wrest a living from an uncompromising land. This is our homage to those who brought water from the mountains by sheer back-breaking force; those who planted trees they would never rest under; those who planned schools they would not attend; those who finally built a community where they would raise fine families who remember and honor them. It is not with maudlin sentiment that we think of them, but with deep appreciation and an acceptance of our own responsibility to others." 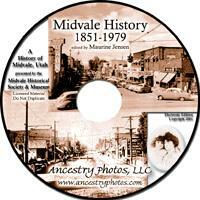 Order your Midvale History CD today! Great value at only $19.95.